Blade length :　45.6　cm or 17.95 inches. Sori : 1.2 cm or 0.47 inches. Width at the hamachi : 3.33 cm or 1.31 inches. 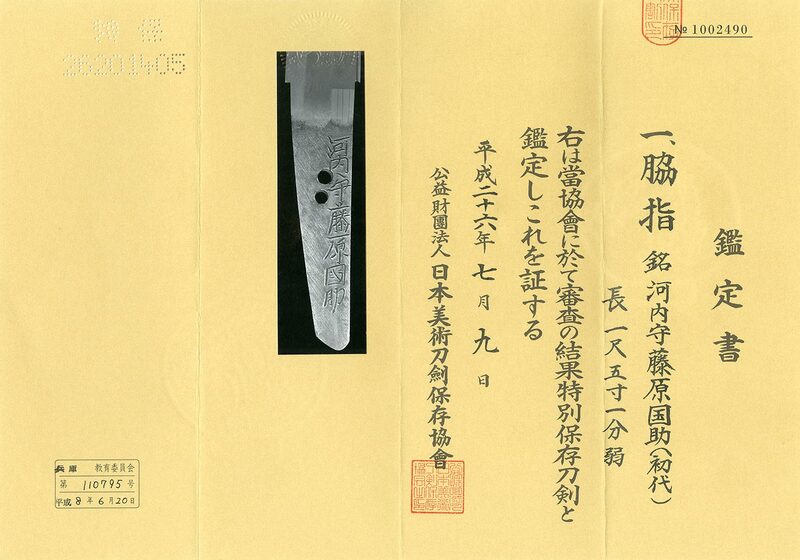 Width at the Kissaki : 2.52 cm or 0.99 inches. Kasane : 0.67 cm or 0.26 inches. Era : Edo period, around Kanei era. Shape : Wide and thick Wakizashi. The Kissaki is long. Jigane : Itame Hada well grained with Jinie attach. Hamon : Nie Deki, Gunome Midare with thick Nioikuchi. In Ha, there are Sunagashi and Kinsuji. Boshi is single round Yakisage style. Special feature: Kunisuke was born in Ise province. to study under the Kunihiro and went with his friend first generation Kunisada. and made many swords and educated many students. Kami Kuniyasu and Ise Kami Kuniteru and so on. Tsuba : Iron Tsuba, flower is engraved with open work. Menuki : Shakudo, braid is engraved with gold color. Kurikata: Shakudo, gourd is engraved with gold color. Fuchikashira: Shakudo Nanako, birds are engraved with gold color. style not artificial shape. This blade is also healthy and nice shape.